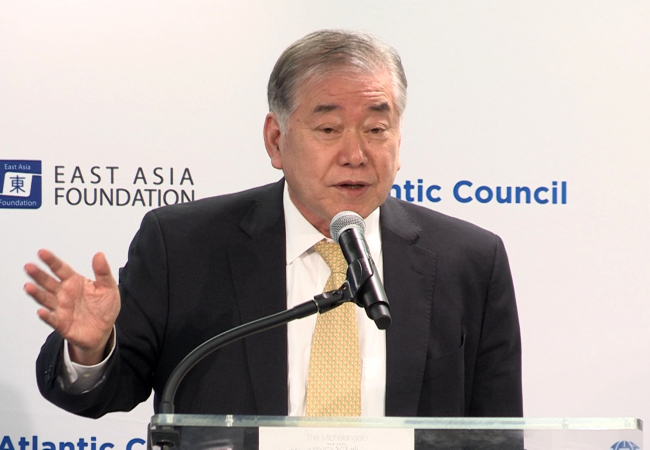 President Moon Jae-in’s special national security and foreign affairs adviser Moon Chung-in continues to voice views that fall short of being in tune with the government. Speaking at a forum Wednesday, special adviser Moon claimed that Seoul’s Defense Minister Song Young-moo had spoken with US Forces Korea commander Gen. Vincent Brooks to keep B-52 bombers out of the Max Thunder exercise. Max Thunder is the joint South Korea-US air forces’ exercise that North Korea cited among its reasons for postponing high-level talks with the South originally scheduled for Wednesday. “B-52 bombers were to be deployed from tomorrow (Thursday) but Minister Song Young-moo (met Brooks) and arranged for it to be excluded from Max Thunder,” Moon said. The Ministry of National Defense quickly denied the statement, saying that Song had only told Moon that the B-52 bombers would not be taking part in the exercise. Adviser Moon urged President Moon to personally speak with North Korean leader Kim Jong-un. “President Moon should speak with Kim before the 22nd if he is to have a message to give to President Trump,” he said. President Moon is set to meet US President Donald Trump in Washington on May 22. “If the Koreas’ leaders do not speak directly, the situation could become very difficult,” special adviser Moon said. While special adviser Moon expressed concerns for inter-Korean and US-North Korea dialogue, Cheong Wa Dae appears more positive. Speaking on condition of anonymity, a top presidential aide said Cheong Wa Dae’s assessment is that Pyongyang remains committed to talks. Last month, Moon Chung-in landed himself in hot water, earning himself a caution from presidential chief of staff Im Jong-seok for a contribution to the foreign policy magazine Foreign Affairs.